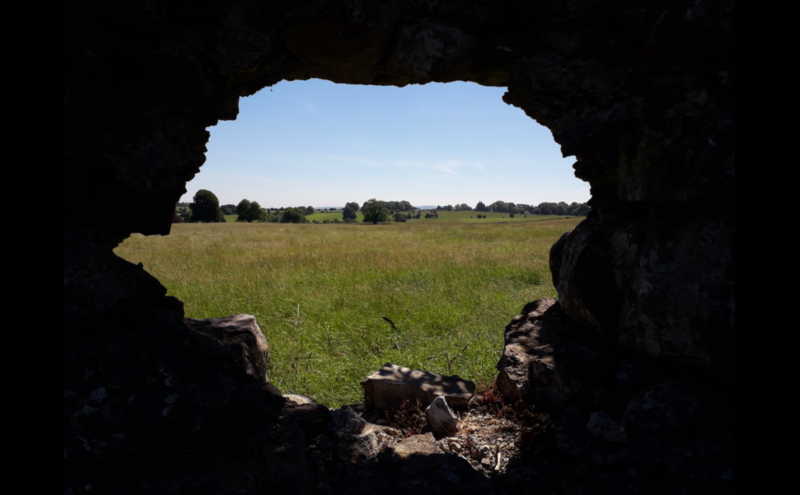 I recently attended the excellent 2018 Famine Summer School held at the National Famine Museum at Strokestown Park House in Co. Roscommon. I was speaking on what pension files can reveal about the remittance of money from America to Ireland, and the maintenance of local community links across the Atlantic. Not far from Strokestown Park House is the townland of Cargin’s Demesne near Tulsk. On my journey home, I took a few minutes to swing by the area, to see the fields where a former Union sailor returned home to die in the 1870s. 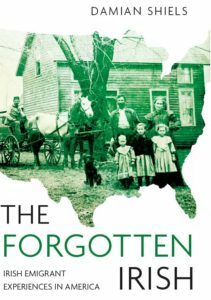 His death led to a series of remarkable interviews with nineteenth century Roscommon emigrants, recorded in the first-person, which offer us insight into both their lives and the importance of place of origin for those in the United States. They are reproduced for the first time below. On 9th February 1863 John Dolan enlisted in the United States Navy. During the three years that followed he spent the majority of his service aboard the sidewheel steamer gunboat USS Tioga. 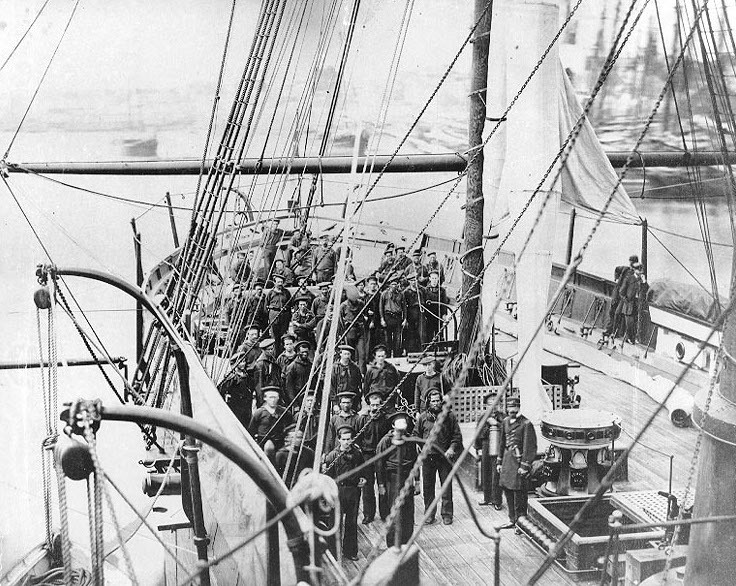 The Second Class Fireman’s war was mainly one of chasing blockade runners as part of forces such as the East Gulf Blockading Squadron, before yellow fever forced the vessel north in mid-1864. John left the Navy on 12th February 1866. A decade later, suffering from a lung complaint, he was advised by his Physician to return to Ireland. Many in New York were aware they would never see him again. 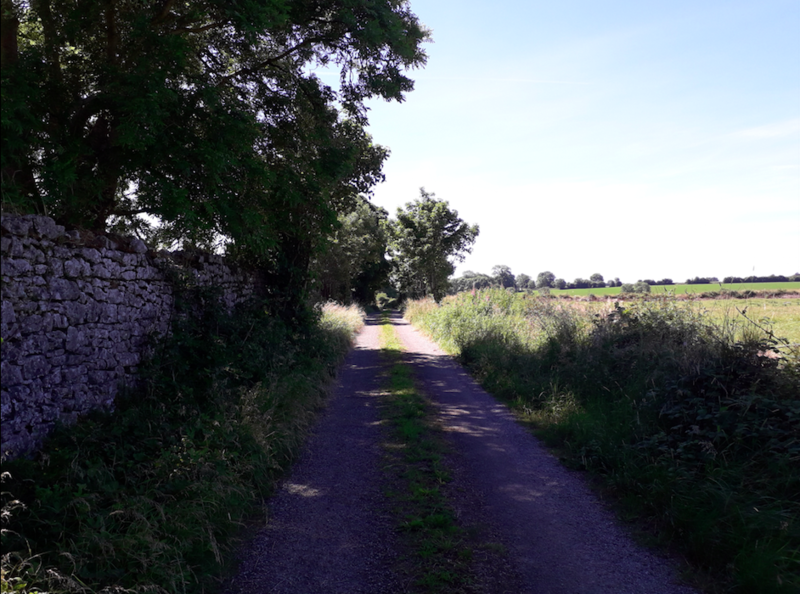 He died just three days after arriving at his father’s farm in Co. Roscommon, and was laid to rest in his local cemetery. The choices John had made on 9th February 1863 caused considerable problems for his widow Ann. In order to claim a pension based on his service, Ann had to prove her relationship to the sailor. But she had not been married to John Dolan, but rather to one John Tierney– her husband had enlisted under an alias. Using affidavits, Ann successfully proved her relationship with John, but doubts about the veracity of her claim led to the appointment of a Special Examiner to her case by the Pension Bureau in 1892. Though a terrible experience for the pensioner (their pensions were stopped until the examination was complete), the detailed interviews they elicited represent an incredible historical resource. Leon Turner was the Examiner appointed to Ann’s case, and he conducted all his interviews in November 1892. In his report he explained that the “claimant is a respectable woman, but very ignorant, living in a large tenement house at No. 494, 9th Ave”, further elaborating that the “claimant and all the witnesses are natives of the same locality in Ireland and were acquainted to some extent with each other over there. They are of the same class of society…poor working people.” Thankfully Turner quickly recommended reinstatement of the pension, which Ann continued to receive until her death on 15th August 1895. The interviews are largely reproduced below. My name is Ann Tierney. My age is 49 years, occupation washing and ironing and my post office address is 494 Ninth Avenue, New York City, N.Y. I am the widow of John Tierney who was a sailor on the U.S. Steamer Tioga during the war. He died in Ireland Jan 3, 1876. I have not married since his death. The Navy is the only service he was ever in. I first met John Tierney about two years before he enlisted. He was courting me when he went in the Navy. I corresponded with him during the war and I always addressed my letters to James Dolan. He enlisted under the name of James Dolan, because he said he did not want his people to know where he was. His mother’s maiden name was Dolan. His father’s name was James Tierney or James Tiernan. I married to John Tierney shortly after his discharge by the Rev. Mr. McAleer at St. Columba’s Church in this city. He never went by the name of Dolan after he came out of the Navy. I had four children by John Tierney but they are all dead but one, a girl around twenty two years old, her name is Mary Tierney. After we were married we went to housekeeping on Christopher Street, near the ferry. I lived there about a year when I moved to West Tenth Street near Waverly Place, where I lived about a year and I then moved to West 18th Street near 7th Avenue. I don’t remember the number of the houses I lived in. I lived in West 48th Street, I forget the number, in May 1876 when he (my husband) went to Ireland. His health had been poor and he went to his father’s house at Cargin’s Demesne, Strokestown, Roscommon County, Ireland. He had only been there a few days when he died of some trouble with his lungs. He died at his father’s house. his father’s name is James Tierney, but in the Old Country Tierney is called Tiernan. He has a brother also at Cargin’s Demesne by the name of Michael Tiernan. My husband had been sick some time with something like consumption, and went to Ireland on the advice of his physician, and it was his intention to return to me upon his recovery or in case he got better. He contracted his disease in the Navy. Before he went in the service he was a stout hearty man. Shortly after his return his health began to fail and he got worse gradually until he went to Ireland. Three days after he got to his old home he died. I claim pension as the dependent widow of John Tierney who enlisted in the Navy under the name of James Dolan. In the Old Country the name is Tiernan…I do not know the name of my husband’s shipmates, I have none of his old letters or papers. Catherine Burns, 47, 409 West 24th Street. Mary Carley, about 60, 539 West 29th Street. I have known John Tierney from the first day he landed in this city. He came from Tulsk, Co. Roscommon, Ireland. I don’t remember the date. I came from that place myself and when he came here he came to my house. I knew his people well in Ireland. I lived about two miles from them…I don’t remember the date he enlisted but sometime in the early part of the War I missed Tierney. He was boarding with me at the time. My husband heard that he had enlisted and went out to look for him. I don’t remember where he went but it seems to be now that he went down to Castle Garden, they were recruiting there at the time, and to all the recruiting offices but he could find no trace of him, because it seems he had enlisted under another name. He afterwards heard that he had taken the name of Dolan, which was his mother’s name…He left New York on the 20th of May and died at his father’s house June 4th, 1876 or rather he was buried June 4/76. I was one of the friends who went to the steamer to see him off, because he was in poor health and we never expected to see him again alive…His name properly is Tiernan, but in this Country people shorten it by calling it Tierney. I knew his brother in the Old Country they are all dead but Michael. Peter Burns, 51, Laborer, 409 West 24th Street. I first met John Tierney at Strokestown, County of Roscommon, Ireland. I can’t give you the date but we were both boys together. I knew his mother and father well. I lived about two miles and half from them…I came to this Country, April 20th, 1861. John Tierney came over before me. Soon after I got here I again met John Tierney. We were both young men, unmarried, and were very friendly having known each other in the Old Country. It was about the beginning of the war. He was out of work and had told me if he did not get something to do soon he would enlisted on a Man-of-War. He had been pretty well to do in the Old Country and was not used to hard work. He told me at the time that if he enlisted he would take his mother’s name, Dolan, and that when I heard from him again it would be from James Dolan. Shortly after that I shipped as a Coal Passer on the “Star of the South.” I did not see Tierney again until he had served his time in the Navy and had come home, but I heard from him occasionally when he was in the Navy, through Ann Collins, who used to receive letters from him and whom he afterwards married…After he came out of the Navy he married Ann Collins. I was present at the marriage. He lived with her up to the time he went home to Ireland to die…I knew the whole family well at home, knew his brothers and sisters, but I can only recall one of his brothers now, his name is Michael. I think he is there yet. It has been so long since I was there I have forgotten the names of most of them. In the Old Country the family name is Tiernan. Nora Carroll, 45, Cook, 1730 Broadway. Catherine Brady, 53, Housekeeper, 450 De Kalb Avenue, Brooklyn. I knew John Tierney from the day of his birth. He was my cousin. He lived in Cargins, Roscommon County, Ireland…He has only one brother living now. The family name is Tiernan, although they call it Tierney here. I don’t know why they call it so. I lived in the same Parish with the family. John Tierney came to this Country long before I did. I came here about April 1889. I did not see him during the War. I never knew him by any other name than John Tierney or Tiernan. I was home at Cargins when he came to his father’s house sick. I can’t remember the date but it was in the Summer of 1876. I was present when he died and I attended his funeral. He was buried in the burying ground called Killcooly County of Roscommon in Ireland. I knew Ann Tierney when she was a girl in the Old Country. She lived near me. Her name then was Ann Collins…I did hear while in the Old Country that he had gone by the name of Dolan, but I never asked him anything about that for when he came home he was too sick to talk much. He died three days after he got to his father’s house. I know what I have stated to be facts because I know the family in Ireland and Tierney’s family here. My maiden name was Tiernan. Thomas Byrne, 25, Laborer, 356 East 13th Street. I was at home at Cargins, Ireland when James [sic.] Tiernan died. I attended his funeral. I don’t remember the date of his death but it was about fifteen years ago. I did not know him very long before he died. I have known his father and mother since my childhood…I don’t know the cause of James [sic.] Tiernan’s death but he came home from America very sick and died shortly after he arrived at his father’s house. He was buried at Killcooly. The family are called Tiernan at home but over here they call it Tierney. James Connolly, 48, Sailor, 310 West 42nd Street. I first met John Tierney at home in Roscommon, Ireland about 1858 or 1859 also knew him when he lived at Cargins, Ireland, sometime before he emigrated to this Country. I knew his parents…I landed in this City from Ireland in September 1863. I don’t know when John Tierney came over. I did not see [him] again until after the close of the War, in the Fall of 1866. We were friendly. I lived then [at] 409 West 24th Street. He used to visit there and I met him out often…We were working together for the same firm here in New York in 1866, weighing logs for Flandran and Hardy. We were quite intimate. He got me the job. Being from the same place at home and working in the same place, we were often together. I did not know Ann Tierney before she married although I knew her people in the Old Country. Her father’s name was Martin Collins. The series of interviews recorded as part of the Examination into Ann Tiernan’s case are a perfect example of the incredible value of Civil War pension files for the study of Irish emigration. They firmly indicate the key importance of locality of origin, and how maintained links across decades led to a continual relationship between these intertwined communities on both sides of the Atlantic. Aside from describing an extremely poignant story of a veteran going home to die, they allow us a rare opportunity to “hear” the voices of these poor people, the majority of whom were illiterate. That alone makes them an invaluable resource. Ann Tiernan Naval Widow’s Pension Certificate, National Archives. 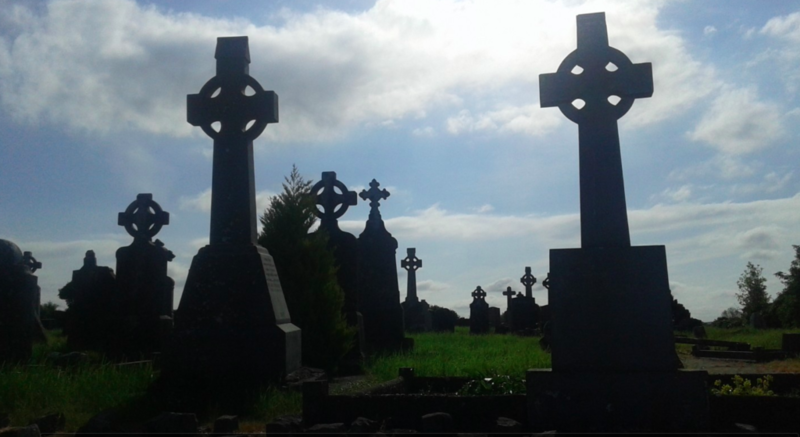 Historic Graves: Kilcooley Graveyard, Co. Roscommon.